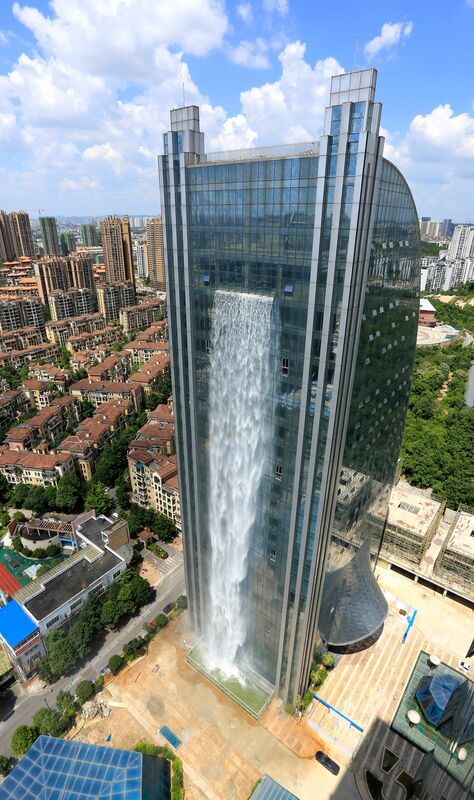 Residents in the Guiyang City, in south west China have been left staring in amazement at a gigantic artificial waterfall that cascades more than 100 metres down the side of a skyscraper. 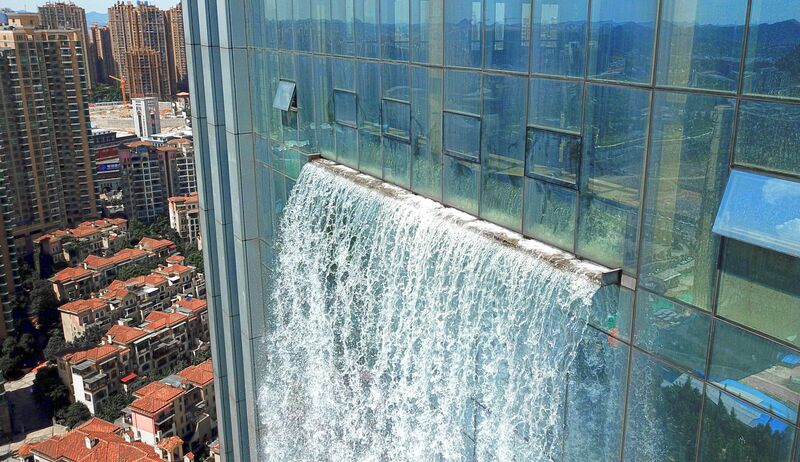 The Liebian Building, in the city’s business district, now has one of the world’s largest water features stuck onto the side of it and it looks amazing. Not only does it look awesome, it’s also something of a feat of engineering, too. There is a huge tank at the bottom that contains several heavy duty pumps that pump the water from the fountain up back up the side of the 121-metre-tall skyscraper, where it promptly falls all the way back down. When the sun catches it just right, it creates a huge rainbow within the waterfall which flows down in front of the glass sided building. Luckily, there is some pretty amazing video footage that shows off this feature. This might seem like a waste of water, but it’s not on all of the time – the huge fountain is only active on special occasions, such as celebrations in the city. Additionally, most of the water used in it is recycled tap water and rain water, according to Guizhou Property Management company. Apparently, only a small portion of the water is from other sources. That doesn’t seem like too much of a waste. Mr Cheng, a spokesperson from Guizhou, told Kan Kan News: “Our building has a four-storey underground water storage and drainage system, from which the water is pumped and recycled. You can see why they only turn it on for special occasions when you know how much electricity it costs to run. Admittedly, it’s only ever on for 10-20 minutes at a time, but one hour of operation would set them back 800 yuan (about £89). But, however costly it is, or however much water it wastes – not as much as you’d think, we’re told – there can be no doubt that it looks excellent. Mr Cheng also added that it is hoped that the building will become a tourist attraction, which would help to pay for at least some of it, you’d think. Maybe, if it gets really hot, people can gather around the bottom and cool down as it sprays water at them.